Balm, Ointment & Cream: Salcura, Wise Ways, EmuaidMAX, Earth's Care! • Divine Davana Oil: Massage onto the pelvic area to maintain female balance and fertility. Caution: Do not use during pregnancy. External use only. 2 oz. ORDER TODAY! Ingredients: Olive Oil Extracts of Organic Mugwort, Damiana, Raspberry, Tulasi & Chickweed Leaf, Dong Quai, Licorice & Black Cohosh Root, Chaste Tree Berry, Jojoba, & Sesame Oils, Blend of Ayurvedic Essential Oils, Flower & Gem Essences. • Hot Flash Cooling Spray: For cooling, soothing relief of hot flashes. External use only. 2 oz. ORDER TODAY! HEALTH RELATED/CREAMS BALMS: Wild Yam E Salve, 1 oz. HEALTH RELATED/CREAMS BALMS: Wild Yam E Salve, 2 oz. HEALTH RELATED/CREAMS BALMS: Divine Davana Oil, 2 oz. HEALTH RELATED/BODY BALM: Hot Flash Cooling Spray, 2 oz. HEALTH RELATED/CREAMS BALMS: Beautiful Belly Balm, 4 oz. HEALTH RELATED/CREAMS BALMS: Beautiful Belly Balm, 8 oz. HEALTH RELATED/CREAMS BALMS: Mama's Chest Rub, 1 oz. HEALTH RELATED/CREAMS BALMS: Mama's Chest Rub, 2 oz. HEALTH RELATED/CREAMS BALMS: Bosom Balm, 4 oz. • Black Blood Root Salve: Penetrating, drawing salve for occasional skin irritations, swellings or bug bites. Caution: For external use only. Do not use during pregnancy or on children. 2 oz. ORDER TODAY! Ingredients: Olive Oil Extracts of Organic Blood Root, Chaga Mushroom, Yellow Dock, Galangal, Goldenseal & Poke Root, Calendula & Red Clover Flower, Chaparral, Sheep Sorrel & Graviola Leaf, Burdock Seed, Pau d'Arco Bark, Beeswax, Essential Oils, Flower & Gem Essences. • White Pine Salve: A penetrative, deep drawing and soothing skin salve. Use for serious skin problems such as inflamed wounds, boils, abscesses, splinters, porcupine quills or insect bites. 1 oz. ORDER TODAY! Ingredients: Olive Oil Extracts of Organic Chaparral, Chickweed, Mullein & Plantain Leaf, Marshmallow Root, Slippery Elm & White Oak Bark, Pine Tar, Beeswax, Castor Oil, Essential Oils, Flower & Gem Essences. HEALTH RELATED/CREAMS BALMS: Black Blood Root Salve, 2 oz. HEALTH RELATED/CREAMS BALMS: White Pine Salve, 1 oz. HEALTH RELATED/CREAMS BALMS: All Heal Salve, 1 oz. HEALTH RELATED/CREAMS BALMS: All Heal Salve, 2 oz. HEALTH RELATED/CREAMS BALMS: All Heal Salve, 4 oz. • Black Walnut Tea Tree Salve: A soothing antifungal salve for persistent skin rashes. A natural alternative to strong steroid creams. Use liberally on a daily basis for eczema, psoriasis, herpes, boils, ringworm and other difficult skin conditions. 1 oz. & 2 oz. ORDER TODAY! Ingredients: Olive Oil Extracts of Organic Black Walnut Hull & Leaf, Birch & Slippery Elm Bark, Calendula, Chamomile, Nettle & St. Johnswort Leaf & Flower, Licorice, Oregon Grape & Yellow Dock Root, Tea Tree Oil & Beeswax. • Witch Hazel Salve: Use for occasional relief of rectal irritations. 1 oz. / 4 oz. ORDER TODAY! INGREDIENTS: Olive Oil Extracts of Organic Witch Hazel & Plantain Leaf, Calendula Flower, Horse Chestnut, Arnica, Red Clover, Chamomile & Yarrow Leaf & Flower, Stone & ButcherÕs Broom Root, Beeswax & Essential Oils. HEALTH RELATED/CREAMS BALMS: Black Walnut Tea Tree Salve, 1 oz. HEALTH RELATED/CREAMS BALMS: Black Walnut Tea Tree Salve, 2 oz. HEALTH RELATED/CREAMS BALMS: Witch Hazel Salve, 1 oz. HEALTH RELATED/CREAMS BALMS: Witch Hazel Salve, 4 oz. • Itch Free Salve: For soothing relief of poison ivy or other irritating plant skin rashes. 1 oz. & 2 oz. ORDER TODAY! Ingredients: Olive Oil Extracts of Organic Jewelweed, Plantain, Chickweed & Witch Hazel Leaf, St. Johnswort & Calendula Flower, Black Walnut Hull, Echinacea Leaf & Flower, Fennel Seed, Aloe Vera Oil, Beeswax, Essential Oils, Flower & Gem Essences. • Temple Tension Balm (Headache Balm): Soothing relief to rub onto your temples. Handy 0.25 oz. travel size. ORDER TODAY! Ingredients: Olive Oil extracts of Skullcap, Wood Betony, Rosemary, Lemon Balm, Lavender, Peppermint, Dandelion, Feverfew & Chamomile, Essencial Oils, Flower & Gem Essences. HEALTH RELATED/CREAMS BALMS: Itch Free Salve, 1 oz. HEALTH RELATED/CREAMS BALMS: Itch Free Salve, 2 oz. HEALTH RELATED/CREAMS BALMS:Temple Tension Balm, .25 oz. HEALTH RELATED/CREAMS BALMS: Arnica Boswella Cream, 1 oz. HEALTH RELATED/CREAMS BALMS: Arnica Boswell Cream, 2 oz. HEALTH RELATED/CREAMS BALMS: Arnica Boswell Cream, 4 oz. • Lemon Balm Cream: A soothing cream to help with herpes, sores or persistent skin problems. 1 oz. ORDER TODAY! Ingredients: Olive Oil Extracts of Organic Lemon Balm & Plantain Leaf, Echinacea & Calendula Flower, Black Walnut Hull, Slippery Elm Bark, Licorice Root, St. Johnswort Flower, Beeswax, Essential Oils, Flower & Gem Essences. HEALTH RELATED/CREAMS BALMS: Lemon Balm Cream, 1 oz. HEALTH RELATED/CREAMS BALMS: Lemon Balm Cream, 2 oz. HEALTH RELATED/CREAMS BALMS: Writer's Salve, 2 oz. • Soothe Your Skin Salve: Natural soothing relief for occasional skin rashes. 2 oz. / 4 oz. ORDER TODAY! Ingredients: Olive Oil Extracts of Organic Burdock, Dandelion, Oregon Grape & Yellow Dock Root, Black Walnut Hull, Calendula Flower, Chickweed, Echinacea, Nettle, Red Clover & Violet Leaf, Lanolin, Beeswax, Grapefruit Seed Extract, Essential Oils, Flower & Gem Essences. • Rose Face Balm: Fragrant moisturizing balm for dry skin. 2 oz. ORDER TODAY! Ingredients: Olive Oil Extracts of Organic Garden Roses, Elder & Calendula Flower, Alkanet, Ecowax, Shea Butter, Glycerin, Essential Oils of Meadow Foam, Tamanu & Rosa Mosqueta & Our Rose Blend. HEALTH RELATED/CREAMS BALMS: Soothe Your Skin Salve, 2 oz. HEALTH RELATED/CREAMS BALMS: Soothe Your Skin Salve, 4 oz. HEALTH RELATED/CREAMS BALMS: Rose Face Balm, 2 oz. • Zeoderm Skin Repair Moisturizer: Zeoderm Skin Repair Moisturizer is effective for severe cases of eczema, psoriasis, dermatitis and other related skin conditions. It is quickly absorbed, non-sticky and penetrates the damaged skin deep down for maximum hydration. Made with patented ZeomaZ ingredient to revitalize and restore skin, and Silicate minerals which are extremely beneficial for damaged, dry, inflamed and irritated skin cells and connective tissues. Zeoderm Skin Repair Moisturizer helps relieve the skin and break the itch-scratch cycle. Perfect for use when skin is especially dry or cracked. No known side effects and suitable for use during pregnancy and breast feeding. Suitable for over 6 months and any skin type. For external use only. 1.7 oz. ORDER NOW! Ingredients: Purified Water (Aqua), Glycerin (Vegetable), Urea, Linseed Oil (Linum Usitatissimum Seed Oil), Cetearyl Alcohol, Olive Oil (Olea Europaea Fruit Oil), Zeolite, Cetearyl Glucoside, Borage Oil (Borago Officinalis Leaf Extract), Ricinus Communis Seed Oil, Jojoba Oil (Simmondsia Chinensis Seed Oil), Phenoxyethanol, Sodium Cetearyl Sulfate, Ethylhexylglycerin, Caprylyl Glycol, Citronellol, Geraniol, Phenethyl Alcohol, Palmaroas Oil (Cymbogogon Martini Oil), Lavender Oil (Lavandula Angustifolia Oil), Geranium Oil (Pelargonium Graveolens Oil), Rose Oil (Rosa Damascena Flower Water). 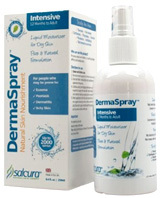 • DermaSpray Intensive Skin Nourishment Spray: DermaSpray Intensive Skin Nourishment Spray relieves eczema, psoriasis, dermatitis, rosacea and dry, itchy skin. Helps provide a rapid itch relief, the fine liquid sinks deep into the skin to nourish skin cells earlier on in their life cycle. DermaSpray Intensive Skin Nourishment Spray is developed specifically for adults and children (12 Months) with It combines an effective steroid and chemical free, nutrient rich formulation with a hassle free spray on application. Suitable for use during pregnancy and breast feeding. No mess when used on skin or scalp and no staining of clothes or bed linen. For external use only. 1.7 oz. ORDER NOW! Ingredients: Purified Water (Aqua), Glycerin (Vegetable), Glyceryl cocoate, Hydrogenated Coconut Oil, sunflower (Heliarthus Annuus) Seed Oil, Safflower (Carthamus Tinctorius) Seed Oil, Lecthin, Sodium Cetearyl sulfate, Cetearyl Glucoside, Cetearyl Alcohol, Ceteareth-25, Phenoxyethanol, Grape (Vits Vinifera) Seed Oil, Isonarnyl Isononanoate, CI 75130. Sea Buckthorn (Hippophae Rhamnoides) Kernel Extract, Rosemary (Rosmaninus Officinalis) Leaf Extract, Eucalyptus Globulus Leaf Oil, Tea Tree (Melaleuca Alternifolia) Leaf OIl, Urea, Orange (Citrus Aurantium) Dulcis Peel Oil, Ethylhexylglycerin, (Caprylyl Glycol, Salt (Sodium Chloride), Lavendar (Lavandula Angustifolia) Oil, Rosemary (Rosmarinus Officinalis) Leaf Oil, Olive (Olea Europaea) Fruit Oil, Sweet Almond (Prunus Amygdalus Dulcis) Oil, Peppermint (Mentha Piperita) Oil, Aloe Vera (Aloe Barbadensis) Leaf Juice Powder, Limonene, Linalool. • Antiac Acne Clearing Spray: The award winning Antiac Acne Clearing Spray is effective for acne, pimples, black heads and white heads. Neutralizes many types of bacteria for maximum results. Fast and deep skin absorption and non-greasy. Contains no harmful artificial ingredients such as Benzoyl Peroxide. Suitable for use during pregnancy and breast-feeding. types. 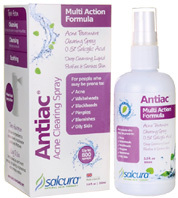 Antiac Acne Clearing Spray comes with a hassle free spray on application, the fine liquid sinks into the skin, disinfecting skin pores while addressing the surface inflammation. The fine liquid sinks into the skin, disinfecting skin pores while addressing the surface inflammation. It can easily be used when spots occur in the hair-line and scalp. Developed specifically for adults and children over 12 months on all skin. For external use only. 1.7 oz. ORDER NOW! • Hand Hydrator: Omega Rich Hand Hydrator contains high concentration of Omega 3, 6, 7 and 9 helps encourage healthy and nurtured skin to deliver highly effective skin hydration and restoration. Quick relief from dry skin and reduces inflammation fast. Hand Hydrator is perfect for people prone to mild, moderate dry or sensitive skin, suitable for use on adults and children over 3 months, and on all skin types. The light lotion absorbs quickly and deeply into the skin, making it easy and pleasant to use on a regular basis. Suitable for use during pregnancy and breast-feeding. For external use only. 2.5 oz. ORDER NOW! Ingredient: Purified Water (Aqua), Ethylhexyl Palmitate, Cetearyl Alcohol, Caprylic/Capric Triglyceride, Avocado (Persea Gratissima) Oil, Jojoba (Simmondsia Chinensis) Seed Oil, Sorbitol, Phenethyl Alcohol, Alcohol, Phenylpropanol, Malic Acid, 3-Hexenol, Phenylisohexanol, Sodium Cetearyl Sulfate, Sea Buckthom (Hippophae Rhamnoides) Kernel Extract, Rosemary (Rosmarinus Officinalis) Leaf Extract, Eucalyptus Globulus Leaf Oil, Camphor Tree (Cinnamomum Camphora Formosana) Leaf Oil, Pine (Pinus Species Twig) Extract, Rosemary (Rosmarinus Officinalis) Oil, Camphor, Lavendar (Lavandula Angustifolia) Extract, Lavandin (Lavandula Hybrida) Oil, Linalyl Acetate, Calendula (Calendula Officinalis) Flower Extract, Chamomile (Chamomilla Recutita) Flower Extract, Clove (Eugenia Caryophylius) Bud Oil, Parfum, Sunflower (Helianthus Annuus) Seed Oil, Cl 75130, Citronellol, Courmarin, Eugenol, Geraniol, Limonene, Linalool. HEALTH RELATED/CREAMS BALMS: 1.7 oz. HEALTH RELATED/CREAMS BALMS: Hand Hydrator, 2.5 oz. 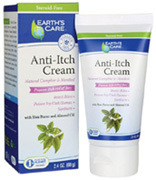 • Anti-Itch Cream: Anti-Itch Cream is blended with Menthol and Camphor to help relieve itching. Menthol offers a dual cooling/warming effect and Camphor calms the itchy area. Both work quickly and naturally to soothe sensory nerves so the itch sensation is reduced. Anti-Itch Cream is used for the temporary relief of pain and itching related with minor skin irritations such as poison ivy/oak/sumac, sunburn, insect bites, and minor cuts and scrapes. Suitable for daily use, non-greasy, and contains no steroids, petrolatum, gluten, phthalates or parabens. For external use only. 2.4 oz. ORDER NOW! Active Ingredients: Camphor (0.5%), Menthol (1%). Other Ingredients: Beeswax, Butyrospermum Parkii (Shea) Butter, Cetearyl Glucoside, Cetyl Alcohol, Citric Acid, Glycerin, Glyceryl Stearate, Heptyl Undecylenate, Hydrogenated Castor Oil, Oryza Sativa (Rice) Bran Extract, Phenoxyethanol, Potassium Sorbate, Prunus Amygdalus Dulcis (Sweet Almond) Oil, Purified Water, Sodium Stearoyl Glutamate, Sodium Stearoyl Lactylate, Stearic Acid, Xanthan Gum. 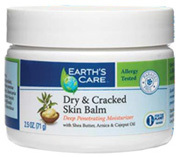 • Dry & Cracked Skin Balm: Dry & Cracked Skin Balm helps calm damaged skin and makes it feel noticeably softer and smoother. Perfect for rough or cracked skin on hands, elbows and feet. Made with Shea Butter, Arnica, Cajeput Oil, and herbal extracts to relieve chapped, dry or damaged skin. Dry & Cracked Skin Balm is suitable for everyday use on damage-prone areas to help keep skin healthy, hydrated, and supple. For external use only. 2.5 oz. ORDER NOW! Ingredients: Prunus Amygdalus Dulcis (Sweet Almond) Oil, Beeswax, Butyrospermum Parkii (Shea) Butter, Vegetable Oil (Glycerides), Gaultheria Procumbens L. (Wintergreen) Oil, Myroxylon Pereirae (Balsam Peru), Arnica Montana (Arnica) Flower Extract, Matricaria Recutita (Chamomile) Flower Extract, Tocopherol (Natural Vitamin E), Eucalyptus Globulus (Eucalyptus) Oil, Rosmarinus Officinalis (Rosemary) Extract, Melaleuca Cajeputi (Cajeput) Oil, Heterotheca Inuloides Flower Extract, Allantoin. • Tea Tree Oil Balm: Tea Tree Oil Balm is made with Shea Butter, Natural Vitamin E and Sweet Almond Oil. Tea Tree Oil Balm is a natural moisturizer for problem skin. Apply topically to the affected area as needed. Allergy tested, no artificial colors or fragrances, non-irritating, no phthalates. For external use only. 2.5 oz. ORDER NOW! Ingredient: Prunus Amygdalus Dulcis (Sweet Almond) Oil, Beeswax, Butyrospermum Parkii (Shea) Butter, Melaleuca Alternifolia (Tea Tree) Oil, Tocopherol (Natural Vitamin E), Rosmarinus Officinalis (Rosemary) Extract. • Pure Shea Butter: Shea Butter absorbs quickly, is suitable for all skin types, and does not clog pores. Shea Butter is valued for its hydrating and invigorating properties. It penetrates deeply, and its moisturizing qualities calm and revive dry, chapped or sun-exposed skin. Use Shea Butter daily to keep skin soft, clear and smooth. It is also an outstanding scalp and hair moisturizer. Apply topically to the affected area as needed. For external use only. 2.5 oz. ORDER NOW! WOMEN'S HEALTH/PAIN RELIEF: 2.5 oz. WOMEN'S HEALTH/PAIN RELIEF: Pure Shea Butter 2.5 oz. Cayenne Heat Ointment: Apply externally for temporary minor discomfort. • Cayenne Heat Ointment: For external use only. 2.5 oz. ORDER NOW! • Cayenne Heat Ointment: For external use only. 4 oz. ORDER NOW! Ingredients: Cayenne Pepper (40,000 H.U. ), Virgin Olive Oil, Oil of Wintergreen, Menthol Crystals & other pure essential oils as fragrances and Beeswax. • Itch Ointment: Apply externally as needed or as directed by your Health Care Professional. For external use only. 4 oz. ORDER NOW! Ingredient: Chickweed Herb & Extra Virgin Olive Oil in a Beeswax Base. WOMEN'S HEALTH/PAIN RELIEF: Cayenne Ointment, 2.5 oz. WOMEN'S HEALTH/PAIN RELIEF: Cayenne Ointment, 4 oz. HEALTH RELATED/CREAMS BALMS: Itch Ointment, 2 oz. • DHEA Plus Cream: Highly absorbable natural DHEA. Formula also contains Aloe Vera Vitamin E and MSM and leaves skin feeling younger and looking healthier. Pre-measured amount (15mg of DHEA) with each press of the pump. Natural cream free of synthetics including Parabens. Non-greasy and formulated for excellent absorption.External use only. 2 oz. ORDER TODAY! Ingredients: Purified Water Glycerin Aloe Barbadensis Butyrospermum Parkii (Shea Butter) Isopropyl Palmitate Caprylic/Capric Triglyceride Stearic Acid Dehydroepiandrosterone Glyceryl Stearate Phenoxyethanol and Caprylyl Glycol Methylsulfonylmethane (MSM) Allantoin Potassium Sorbate Cimicifuga Racemosa Vitis Vinifera (Grape) Seed Extract Eleutherococcus Senticosus Root Extract Arctium Lappa Root Extract Chamomilla Recutita (Matricaria) Extract Tocopherol (Vitamin E) Lecithin and Sodium Bicarbonate. • Testro Max for Men: Designed specifically for men's needs. Each full press of the pump provides approximately 75 mg of Boosting Complex Solution and 15 mg of DHEA. External use only. 4 oz. ORDER TODAY! Ingredients: Purified Water Glycerin Boosting Complex (Water Ethanol Liver 30X Pituitary 30X Orchitinum 30X Phosphorus 30X Insulin 30X Zincum Metallicum 12X Arginine 8X Ornathine 8X Adrenocorticotropic (ACTH) 30X) Aloe Barbadensis Caprylic/Capric Triglyceride Helianthus Annuus (Sunflower) Seed Oil Butyrospermum Parkii (Shea Butter) Stearic Acid Dehydroepiandrosterone (DHEA) Glyceryl Stearate Isopropyl Palmitate Stearyl Alcohol Phenoxyethanol and Caprylyl Glycol Methylsulfonylmethane (MSM) Allantoin Sodium Hyaluronate (HA) Potassium Sorbate Diindolylmethane (DIM) Serenoa Serrulata Fruit (Saw Palmetto) Extract Lecithin Tribulus Terrestris Extract Prunus Africana Bark Extract Eurycoma Longifolia Jack (Tongkat Ali) Extract Epimedium Sagittatum Leaf (Horny Goat Weed) Extract Mucuna Birdwoodiana Stem (Mucuna Pruriens) Extract and Sodium Bicarbonate. HEALTH RELATED/CREAMS BALMS: DHEA Plus Cream, 2 oz. HEALTH RELATED/CREAMS BALMS: Testro Max for Men, 4 oz. • Retinol A 1% Cream: Retinol A 1% Cream delivers a high concentration of retinol to moisturize the skin and to diminish the appearance of fine lines wrinkles and skin irregularities. Delivers a high concentration of retinol to help diminish the appearance of fine lines wrinkles and skin irregularities. Infused with Green Tea an antioxidant to help protect from free radical damage to the skin. Leaves skin moisturized, toned and refined. Formulated to defy the visible signs of aging. Non-greasy and formulated for excellent absorption. Formulated with Green Tea, Vitamin E and Vitamin C to focus on intensive moisturizing and softening of the skin. Discover natural anti-aging with Retinol A 1% cream. 1.7 oz. ORDER NOW! • Pure Tamanu Oil: Natural Care for healthy smooth blemish-free skin. 100% Pure Organic Tamanu Oil for skin rejuvenation. Traditionally used by Pacific Islanders for its therapeutic properties and ability to promote healthy skin renewal. Cold pressed from nut kernels without using heat or chemicals. Very little Tamanu Oil is needed as it takes just a few drops to cover the affected skin area. Penetrates quickly and provides soothing comfort. Don't be fooled by the other Tamanu Oils—most are combined with other oils. Pure Tamanu Oil is 100% pure and organic.External use only. 1 oz. ORDER TODAY! • Colloidal Silver Spray: Colloidal Silver Spray contains 30 ppm of pure colloidal silver. We use proprietary technology to process this high quality colloidal silver for maximum effectiveness. You may expect several health benefits from using colloidal silver topically. Spray enough to cover desired area. Repeat as needed. For external use only. 8 oz. ORDER NOW! Ingredients: Distilled and ozonated water, 99.999% pure silver. Contains no additives, coloring or stabilizers. •Pure Magnesium Oil: Pure Magnesium Oil is a concentrated mineral complex from the pristine waters of the Great Salt Lake, an inland sea in Utah, USA. The waters of the Great Salt Lake are 11 times more concentrated than seawater and are high in all natural magnesium chloride. Plus, they contain over 72 ionic trace minerals, including selenium, zinc, gold, copper, and potassium, which can help protect the skin from premature aging, reduce the appearance of wrinkles, and improve skin elasticity. In addition, minerals are the catalysts to skin cellular rejuvenation and can help maintain healthy moisture balance. The many benefits of Pure Magnesium Oil include: soothes the skin; maintains thick, healthy-looking skin; rejuvenates the skin; improves look and feel of skin, increases skin elasticity and firmness. WARNING: DO NOT SPRAY IN EYES OR ON FACE. 20 sprays contain approximately 250 mg of elemental magnesium for healthy skin. 6,000 mg of magnesium chloride per 2 fl oz. For external use only. 8 oz. ORDER NOW! Ingredients: Concentrated inland seawater from Utah’s ancient inland sea, the Great Salt Lake, which is naturally high in ionic magnesium chloride and contains over 72 trace minerals. Contains no other added ingredients. Does not contain oil. HEALTH RELATED/CREAMS BALMS: Colloidal Silver Spray, 8 oz. HEALTH RELATED/CREAMS BALMS: Pure Magnesium Oil, 8 oz. HEALTH RELATED/CREAMS BALMS: EmuaidMAX First Aid Ointment, 2 oz. HEALTH RELATED/CREAMS BALMS: Emuaid First Aid Ointment, 2 oz. HEALTH RELATED/CREAMS BALMS: Natural Belly Oil, 3.4 oz. HEALTH RELATED/CREAMS BALMS: Repairing Body Balm, 0.56 oz.